In accordance with the FTC guidelines, we are required to inform you that some of the links may be affiliate links. When this is the case, if you purchase products through these links then we receive a commission. We are independently owned and the opinions expressed here are our own. Florence is one of the most visited towns in Italy accordingly to different ratings. You can find here not only tourists running here and there to see everything possible in a few hours available before they have to take the next train. Many entrepreneurs come to this city during the numerous specialized industry shows. Especially those bound to the world of fashion. And it's not by chance that one of the most beloved luxury brands (second by the number of items sold in the world) begins its story in Florence: Gucci in its rating published about a month ago announced to have two Gucci Places in the town this year. 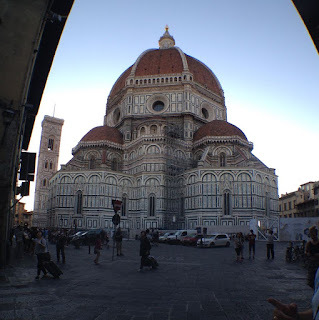 I visited Florence different times mostly not as a tourist but as a translator and, for this reason, I had not the possibility to see the town: I did not have much time for the walks. Imagine how sad it is when you live more than 20 years in Italy, travel regularly, but never visit anything except the railway stations or the airports. This is why I elaborated a "sly" strategy that allows me to visit places I'm interested in: I arrive at least one hour earlier and go directly to the tourist attraction I want to see. This is how could my one-hour tours born. 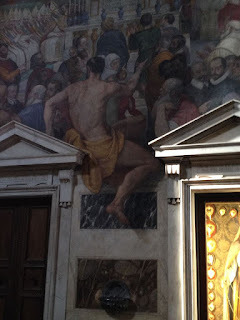 You will remember my posts about the walks in Rome in this blog. So, I bought a city-map from Florence and visited one-two-three places at a time. Now, if I arrive in Florence, I know what and where to see. Today I don't want to tell you about the known things you will find in every book, I'll tell you about ONE picture I love. I did not expect to see something like this in a church and I was really very impressed by it even if there are much more precious pictures in the central nave of the church. 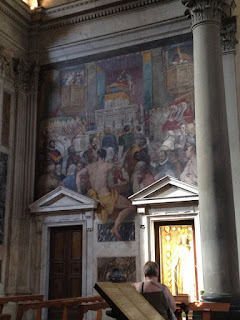 As you can see in the photos it's a (left) chapel, very spacious. And this is why the leg of the man seems to be naturally out of the frame. The church, S. Marco, is situated not too far from the railway station and contains a great number of precious pictures of the XV century. So, if you have only one hour, you can still see something important in Florence, too. We’d love to hear your comments and experiences. Feel free to leave a comment or ask a question, below, in the comment section. Matterhorn, 4,478 m (14,692 ft) high, is the third high mount in Italy and has another name in Italian, Cervino. If you travel with a car and want to visit this place, you have to remember the Italian name because the road signs you will see everywhere are written in Italian: the road name is Cervinia and you have to be very careful to find it when you reach the village Chatillion in Valle D'Aosta. I came there in October, 20, and the village was empty and quiet. The new touristic season had to begin on Oct. 27. I even could not find an open supermarket to take something for a little "pick-nick" on my way home. The main entertainments are for the skiers here, but if you love the wild nature, it's an excellent place for hikers and those who love relaxation and silence. Nature is wonderful there and there are many wild animals in the mountains. They know, nobody will hurt them. So, it's possible to see them really very near specially if you walk at feet. One friend, a hunter, told me there are only some species they can hunt. And we even could see one of them, a chamois, but it was very far from us. From my perspective, the other interesting peculiarity of these mountains are the lakes. There are so many of them everywhere, and you can find them even at a very high altitude. 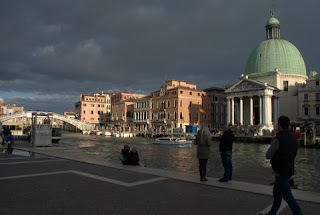 Venezia is one of the most requested by tourists places of the world and maybe you do not agree with me that it's a place where it's possible to go just to have some hours of relax. Yes, you can find crowds, thousands of persons, when you try to arrive in the most desired by all S. Marco square, But I can prove, you are not right. And will explain, why it's one of my favorite destinations for one-day trips. First of all, you have not to choose the most popular feasts like Carnival etc for your trip. Though, if the feast lasts one week (Carnival), you can perfectly choose not the busiest day to taste what it is. Well, if you want to rent the most beautiful mask and interact with the tourists, you HAVE to choose the central streets. The second tip is to avoid the most beaten streets. Venezia is not so little town. Spend about 15 euros for a good city map and go your own way to the S.Marco square. It will be MUCH more interesting than going to a jostling crowd. And you will see the same things - the shops are equal everywhere. If you do not have particular desire to stay all day in S.Marco square, take a ferry (N°4, I think) directly under the railway station (photo of this post) and go to the Murano island (Colonna stop). The itinerary is surely worth those 7 euro you have to pay for the ticket. You will see the cemetery on the water (it's on the island, too, but you think it is situated on the water when you pass it). And there are normally many curious boats in Laguna. So open your eyes and the camera and go! At the cemetery, you can make a stop if you want and pass one hour there to take than the next ferry to Murano. After this nice meal on Murano, take a ferry, turn back in Venice and land near S. Marco square (San Zaccaria stop). Do not forget that you will need some more than one hour to turn back to the railway station at feet from there. So, be aware of how much time you need for this walk. My advice is to purchase a ticket to climb the bell tower and to see Venice from this about 100 meters high Campanile. Today, when the train tickets cost not much, it's possible to organize one day tour to Venice from any part of Italy. In case you have to come from Sud, you can take a night train, arrive in the morning, stay all day in Venice and take the return night train in the evening (changing in Bologna or Rome). If you have to stay all night in Venice, you have to remember that the railway station remains closed from the 00:30 till 5:00 AM and the toilets can be closed at all. Use them in the train before you arrive or in any other place you see on your way. Graglia is a bead of the long string of Sacred Mountains you can find in the Alps area of Italy. These are religious buildings that include a basilica, houses for monks and visitors, different chapels carrying to the basilica. Actually, some of them are well kept, others are not so popular and are abandoned to their destiny and to the pity of nature. Yesterday, we visited one of such disheartening but incredibly beautiful places, Sanctuary of Graglia situating not far from Biella, Piedmont, Italy. Once it was a popular place. The buildings are still very impressive and there is a big house for clergy that seems to be completely empty. The project (1616) was worthy: it had to be a new Gerusalemme and the chapels, that educational itinerary leading to the top of the mountain, had to be 100. You could find some of them if you have more time to explore the area. From my perspective, the best and very touching is the cloister with the statue of Madonna posted on the columns and a fountain, similar to that of Oropa, with a big cook to drink. I have to say that the water is the cleanest and the tastest I've ever drunk. On November, 15, we found flowering camellias and a fantastic astonishing flower there. Unfortunately, I don't know the name of this plant. There were some autos parked near the basilica and we waited that the mass finish. The basilica is spacious and there were two very big censers (something I've never seen before). Very interesting is the chapel on the left where is the only statue from the original project, the statue of Madonna from Loreto, destination of pilgrimages from the time the statue arrived in Graglia. Other tourist attractions are surely beloved by all: excellent local cuisine. Avellino is a little city in Sud Italy known to many persons as a hometown of the singer Madonna. Not many tourists know about the many interesting attractions they could discover if they would stay some days here. Though the best choice would be to rent a car if you decide to have your vacation there because many interesting places to visit are difficult to reach without a car. First of all, you could visit the archeological museum where there are some really rare examples of the artworks of the pre-historical inhabitants of this region. They were afraid of the forces of nature, Earth and were devoted to an interesting deity named Mefiti. Not too far from Avellino you can observe a very strange place: it's a kind of mud pond that boils and venomous steams go out from it. This steams have no odor or color and it's impossible to understand you are poisoned and are dying. This is why the place has a fence around it and is possible to observe it only from the high of the hill. Votive statues you can see in the museum of Avellino can tell interesting stories: they were thrown in the mud of the pond and the deity turns them back after some days. The wooden pieces become resistant to severe weather and time conditions and the metal pieces become clean and shining. The second place to visit near Avellino is the holy mount with one of the most important Benedictine monasteries of Italy. The famous Holy Shrine was hidden here for some time during the WWII and you can see a big hall dedicated to it there. The monastery is probably the third important after Montecassino and nearby Badia of Cava dei Tirreni. This monastery is not only an important sanctuary absolutely to visit for the believers, but there is an astonishing picture of Madonna that will convert to Christentum everybody who sees it. Turin is a capital of cultural events and you can find a bit of all kinds of entertaining there. Last two weeks it hosted a bouquet of folkloristic festivals. They all were in Lingotto. We visited it a week ago and could enjoy the area and emotions of this great feast. On my photos, you can see some moments of three festivals: Orient, Irish and American. It was interesting to notice how changed the interested, but reserved visitors of the Oriental Festival to cheerful and playful once when they entered the Irish shed. Or those were different audiences? I don't know, sincerely. I began to dance with them when I entered there. Some excellent beer and good grill meat completed the state of joy and participation. I have to say you that the Irish bands were very very brave and famous. The last part was dedicated to the world-known symbols of USA. Even if the title was Wild West, what you could see there, remembered surely 50th-60th. Really interesting and full of emotions day. I'm not sure, but I think, such festivals are just a tradition in Italy: I remember, they were in Naples one year ago. ============== We’d love to hear your comments and experiences. Feel free to leave a comment or ask a question, below, in the comment section. Valle D'Aosta seems to be another world especially if you visit it in winter. The winter in all other towns, around the valley, seems to be a spring, but you enter in this particular valley then and... you are in the kingdom of Santa Claus. So, here, in the first photo, we are in an interesting place: you can see the narrow passage leading you to Valle D'Aosta. And you can see a normal Italian winter here. But when you continue for 20-30 km-s, you can see a completely different situation. Give a look at the photos of our journey in the valley. No, such a snowy weather we found when we reached the destination could not offer "normal" kinds of recreation of this period. It was so dangerous that the roads were closed the day after we left it. But we were really fascinated to see this incredible world of snow and to enjoy every minute of the time we passed there. Many photos I took from the car, so they are not very clear, but I think, the sensations of the "parallel" life are expressed better with these not very professional photos. The temperature changed from minus to plus next day and the magic transformed the snow in the rain. Imagine our shoes that were not ready for these changes. Mountains of the snow around us and rivers of water that fall on you and flow under the feet... and grey grey grey colors of everything. Next morning donated us splendid views ...and icy roads. It was incredible, but it was difficult to even make some steps from the house. The ice did not allow us to walk. But in any case, it was an unforgettable adventure.